Cambridge Audio launches compact hi-fi and AV systems | What Hi-Fi? It's just unveiled two new product ranges at the Top Audio show in Milan. The Fusion is a £299 one-box micro hi-fi system in the mould of Denon's D-M35/37 and Onkyo's CS-525UKD, while the Sonata is a two-box 2.1 receiver and CD or DVD player. The Sonata receiver is available in two versions: the DR30 with DAB/FM tuner for £299, and the AR30 FM/AM model for £229. The matching CD30 CD player is £179, or alternatively you can choose the DV30 DVD player for the same price. All models come with a separate iPod dock giving full remote control of your iPod using the system's remote control, although the dock is not compatible with the Apple iPhone or Shuffle. The Sonata 2.1 receivers deliver a claimed 40w per channel, while the DVD player offers upscaling to 1080p via HDMI. You also get a front-mounted MP3 socket for connecting other portable music players, sleep and alarm timers, a subwoofer output and a vacuum fluorescent display. If music rather than movies is your thing, the CD30 CD player has a Wolfson WM8716 DAC and a new servo transport, rather than the DVD-ROM transport more typically used in such products, says Cambridge Audio. And for those who want a simple, compact one-box hi-fi system, the Fusion delivers 30w per channel, includes a CD player and DAB/FM tuner and a 2.1 amplifier with a subwoofer output. 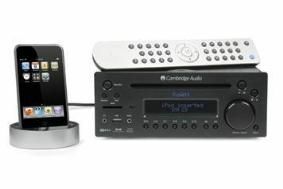 The system was designed to work with Cambridge Audio's S30 stereo speakers (optional), has front-mounted USB and SD card slots, can play MP3 and WMA-encoded tracks on CD and includes a headphone socket. All models are available in black or silver.